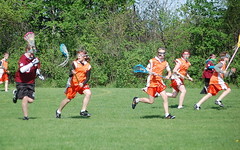 Our club mission is to have fun and learn the game of lacrosse. We believe we can best succeed by showing good sportsmanship and respect for the game. 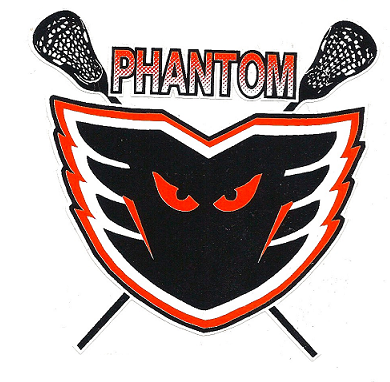 The Phantoms Lacrosse Club was started in the 1990's with the goal of introducing the game to the youth of Franklin County. Since our first season, there has a been a small of group of volunteers steering the club. The primary purpose is to teach and promote the game of lacrosse in a fun, safe, and respectful environment. We believe in "Honoring the Game." This means as a club we strive to instill the values of sportsmanship, respect, teamwork, fair play and the love of the game. These values are important in developing our youth into contributing members of our community. As a member of US Lacrosse, we follow the practices outlined by the Positive Coaching Alliance. This is a basic outline of what we offer. New members are welcome at all ages! Grades K-2 - Our initiation program is geared towards teaching the basic skills of lacrosse. The rules of the game and required equipment are very different for boys and girls lacrosse, and we are excited to offer both a co-ed option and a girls option at the PK-2 level. Practices are held once a week on Friday for our co-ed and girls groups. There are no full field games, but rather small sided games that help promote individual skills and concepts. This program is focused on having fun and getting kids excited about lacrosse. Travel is usually limited to Hard'ack or Collins Perley Complex. Grades 3-6 Girls - Basic skills practice is still an important focus. Growing the girls game is important. Much of the time will be spent practicing the basic skills, having fun and introducing some basic team concepts. Practices are held twice a week during the evening at Hard'ack. Jamborees are held on Saturday or Sunday. Travel is limited to the Chittenden County area, but may include a jamboree in Middlebury. Grades 3-4 Boys - Basic skills practice is still enforced, but some basic full field concepts will be introduced. This is a fun introduction to the full field game. Practices will be held Tuesday and Thursday evenings for 1-1.5 hours. Jamborees are held on Saturday. Travel is usually limited to the greater Chittenden County area, but may include a jamboree in Middlebury or elsewhere. Grades 5-6 Boys - Focus is still on basic stick and body skills. Skills are honed throughout the season and are essential to teaching team concepts. Players learn about some basic team concepts. Practices will be held Monday and Wednesday for 1.5 - 2 hours. Jamborees are held on Saturday. Travel is usually limited to the greater Chittenden County area, but may include a jamboree in Middlebury and playoffs. Grades 7-8 Girls - You are never to old to start! Skills will be a strong focus, but team concepts are essential as players are becoming more competitive. Practices are held two or three evenings per week for 1.5 - 2 hours. We are part of the Northern Vermont Youth Lacrosse League and will take part in Saturday jamborees. Travel is limited to mainly the Chittenden county area, but may include an end of year jamboree in Middlebury and playoffs. Grades 7-8 Boys - You are never to old to start! Skills will be a strong focus, but team concepts are essential as players are becoming more competitive. Practices are held two or three evenings per week for 1.5 - 2 hours. We are part of the Northern Vermont Youth Lacrosse League and will take part in Saturday jamborees. Travel is limited to mainly the Chittenden county area, but may include an end of year jamboree in Middlebury and playoffs.